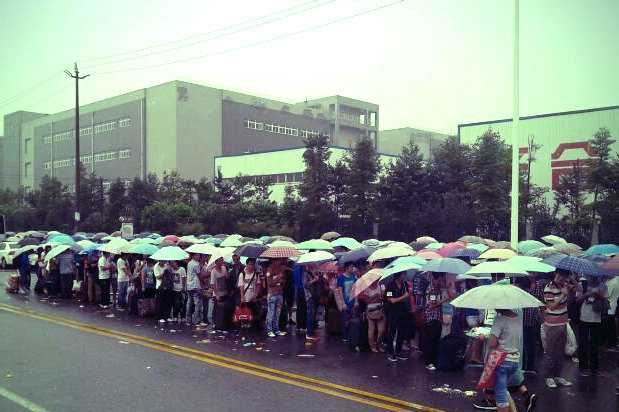 Young jobseekers lining up for Foxconn summer jobs at the Foxconn plant in Chengdu have not been hindered by the Heavy rains that have battered Chengdu over the past few days. The images provided after the jump demonstrate thousands of people armed with rain gear and umbrellas, lining out in the rain to get their chance to audition for getting jobs at Foxconn! It gets obvious that Foxconn plant in Chengdu is hiring now for summer jobs. Multiple trusted sources claim that the plant is hiring a large number of summer workers, which may still have openings – and this entire buzz is about the production of upcoming devices by Apple! The only requirement to get a job is to have perfect eyesight, (not to mention the ¥ 150 (about $24) registration fee). Moreover, Foxconn plant in Zhengzhou is also rumored to be hiring a large number of workers, as we’ve previously covered. Sources claim that “one of the iPhone assembly lines inside the factory has recently assembled only five units of “the new iPhone” on a night shift.” The mentioned assembly line is said to consist of more than a hundred workers. However, the “trial production stage” starting date is still not unveiled. There are in fact thousands of contenders lining up for Foxconn jobs as the Chengdu and Zhengzhou divisions, looking forward to the iPad mini and next generation iPhone production respectively! Check the images and do not hesitate to have your say!